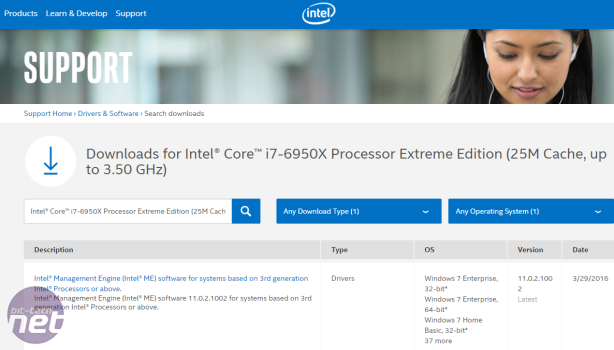 Tech website Tweakers has uncovered what appears to be an official Intel support page that reveals its 14nm Broadwell-E 10-core monster CPU - the Core i7-6950X. Slated for release this year and compatible with current LGA2011-v3 X99 motherboards, the Core i7-6950X hasn't been confirmed publically by Intel, but previous leaks point to it being the company's new desktop flagship. The support page that was discovered reveals its full name - Core i7-6950X Extreme edition, and that the CPU will have 25MB cache and a maximum turbo frequency of 3.5GHz. That's the same as the current flag ship - the 8-core Core i7-5960X, which had 20MB cache. The Core i7-6950X Extreme edition will be the first 10-core CPU targeted at mainstream desktop customers and unlike its Haswell-E predecessors, will make up part of a 4-CPU launch. Haswell-E CPUs launched a year and a half ago in September 2014 and comprised the Core i7-5960X, Core i7-5930K and Core i7-5820K. The CPUs varied in a number of ways features-wise. For example, only the top-end Core i7-5960X had eight cores, while the lower end Core i7-5820K lacked the full 40 PCI-E lanes of the two more expensive CPUs. Broadwell-E is widely expected to have an additional CPU bringing the total number of new products coming to LGA2011-v3 this year to four. Previous leaks point at the Core i7-6800K and Core i7-6850K sporting six cores and twelve threads, while the Core i7-6900K has eight cores and 16 threads with the 10-core 6950X sitting at the top of the pile. Broadwell-E could be one of the last launches to feature in Intel's tick-tock development cycle, which the company has stated will soon cease in favour of a three-phase development cycle. Are you planning on building a Broadwell-E system? Let us know your thoughts in the forum.